Wonderclaw is a traditional arcade-type game run by Bigbsy Shadington. Players buy widgets and use them to activate the machine of their choice - then they can fish around inside their chosen machine to grab a prize they (hopefully) like! Like other NeoCash games, widgets can be brought in packs of 1, 5 or 10. 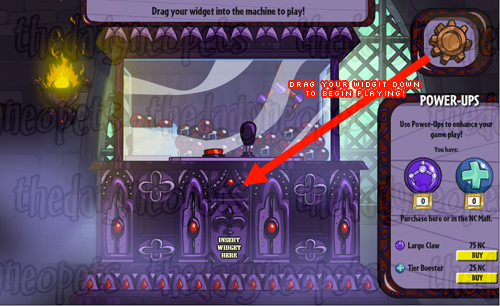 Each widget gives the player one chance to pull out a prize. Players can also purchase Power-Ups which enhance their original widgit. At the moment, there are only two different types of power-ups available. This upgrades the prize-level you were going to receive. For example, if you had picked a Silver-level prize originally then using this would upgrade you to a Gold-level prize instead. Allows your Claw to pick up two prizes per widgit, rather than just one! First, you need to buy some widgits from the NC Mall and activate them in your inventory. To activate your widgets select the "Activate" option from the drop-down menu when you click on it. Once you've done that, head over to WonderClaw to start playing! In the game, the first thing you need to do is pick a Machine to play. Click on any one of the machines to find out which one it is so that you know you are fishing for the style of prize you would like. Don't worry; clicking on a machine doesn't mean you have to use it. You can switch to another machine without spending any Widgets. Once you have picked a machine, then select "Play Game" to use it! After the machine loads, you need to drag your widget into it to start playing. You now get 30 seconds to move the claw with your arrow keys until you've got it positioned exactly where you want it. Once you're ready to grab your prize, hit the space bar! The claw will drop and pick up a prize-ball for you. Incidentally, if you haven't hit the space bar by the time 30 seconds is up then your claw will automatically drop and pick the closest ball. The pattern on the prize-ball you select does not affect the prize you receive - its all completely random. Once your ball falls you can click on it to see which prize you've received! Unlike Jubjub Power Bounce, in Wonderclaw you only get one shot at a prize. If you don't like the item you've been given, its just bad luck and you will need another widget to play again. WonderClaw Widgits have been given out free to Neopians. Bigsby Shadingtons Wonderclaw Widget 1-Pack This widgit was a free prize available to be claimed from the Altador Prize shop in 2011. The available machines at this time were Fire, Patchwork and Cloud. Bigsby Shadingtons Wonderclaw Widget 1-Pack A widgit was given out through the Advent Calendar on December 10, 2011. The available machines at this time were Gothic and Royal. Bigsby Shadingtons Wonderclaw Widget 1-Pack A widgit was given out through the Altador Cup Prize Shop in July 2018. The available machines at this time were Rock'N'Roll, Warrior and Haunted Faire.